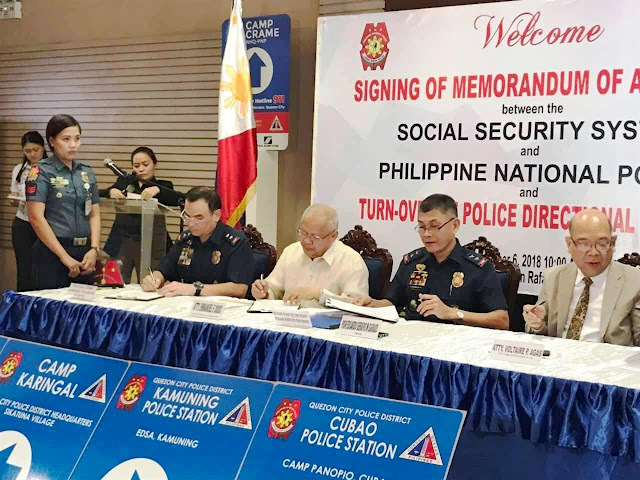 The Social Security System (SSS) and the Philippine National Police (PNP) on Thursday strengthened their partnership as both institutions signed a Memorandum of Agreement that will provide social protection to the private sector while also promoting a peaceful and safe environment. SSS President and Chief Executive Officer Emmanuel F. Dooc and PNP Chief Director General Oscar D. Albayalde, represented by Police Director Eduardo Serapio M. Garado, led the signing of the MOA which aimed to establish a framework that will strengthen the enforcement of and extend social protection to the working class. It also aims to share significant resources that will equip PNP and SSS to attain its respective mandates. “Both SSS and PNP commit to provide protection, particularly social and security, to our members. That’s why we are glad to have entered into an agreement with PNP as they will help maintain peace and order while we reinforce the Social Security law, especially as we continue to implement our aggressive collection efforts like the Run After Contribution Evaders (RACE) campaign, Operation Tokhang-SSS Style and soon for the serving of the Warrant of Distraint, Levy, and Garnishment (WDLG),” Dooc said. The MOA formalizes the coordination of SSS with the PNP regarding activities, including serving of lawful Orders and execution of all warrants that would require the police assistance and protection to SSS representatives. “There is no slowing down for SSS in going after erring employers to ensure that our members’ right to social security is protected. We need the support of the police force as we strongly administer our nationwide campaign to increase contribution collection and promote compliance to the Social Security Law by filing charges and serving warrants to these employers who run away from their obligations to SSS and their employees,” Dooc added. This is not the first time that SSS and PNP are working close together as the pension fund and PNP have ongoing partnerships under the programs Operation Tokhang and Run After Contribution Evaders, where they serve warrants against erring employers and post show cause orders in non-compliant establishments, respectively. “As of November 6, there were already 102 employers subjected to RACE conducted in 10 regional areas, namely, Lipa City, Dagupan City, El Nido, Palawan, Davao City, General Santos City, Bacolod City, Pagadian City, Laoag City, Naga City and Butuan City. This has been part of our regional campaign as part of our aggressive efforts in collection contribution, promoting compliance and ensuring higher coverage of employees,” Dooc said. The event also highlighted the turn-over of 762 directional signages to PNP from SSS. A Memorandum of Understanding was signed last year between the two agencies that led to the implementation of Standardized Police Directional Signages that aims to promote a safe, secured, orderly and peaceful community. Based on the MOU, the SSS is in-charge of the production of the uniform signages while the PNP will do the installation in coordination with local government units nationwide. Last December 12, 2017, the PNP and SSS initially installed signages in selected places in Quezon City and San Juan.